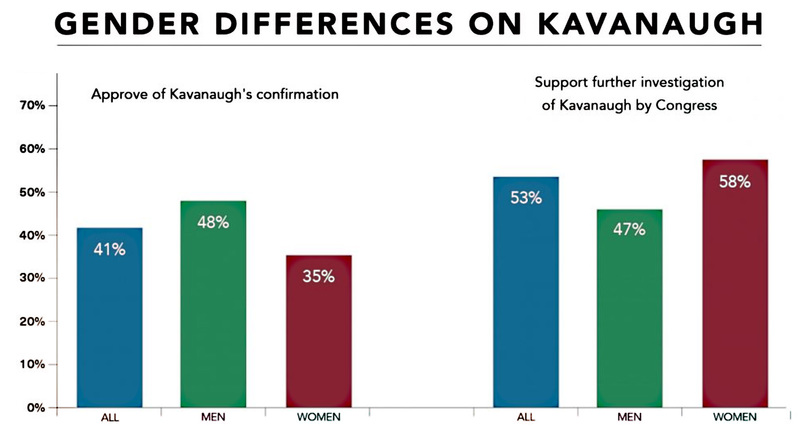 Only 35 percent of women approve of Kavanaugh’s confirmation, 13 points behind men. And 58 percent want Congress to continue investigating him, 11 points more than men. These aren’t the biggest gender differences ever recorded on a political issue, but they’re pretty big, especially for something that’s opened a lot of raw wounds just a month before an election. And I want to repeat something I alluded to a few days ago: Democrats shouldn’t be afraid to use this issue loud and hard. Republicans are pushing the notion that Democrats have turned into some kind of lawless mob, but that’s just politics. Democrats should cool it on stuff like impeachment or Russia probe stuff that goes way beyond the evidence, both of which really are kind of nutty at this point. But they don’t need this stuff anyway. Their economic policies are popular, while Republican policies are widely disliked. Likewise, their views on cultural issues are popular, as poll after poll has shown. The bottom line is this: Donald Trump took advantage of a brief moment in time when even center-right voters were open to Trump’s overt racism after eight years of President Obama, but that’s long since faded. Today, his views lose more votes among centrist voters than they win among his working-class white base. Obviously every congressional district is different, and Democrats don’t have a license to go crazy. But they should be unafraid to vigorously promote liberal views on race, gender, abortion, and immigration. Republicans are trying desperately to pretend that this will hurt Democrats more than help them, but their internal pollsters know better. Donald Trump has done nothing for the working class with his corporate tax cuts and his tariffs on Canadian steel and aluminum. At the same time, his endless “lock her up” rallies are turning off everyone except the folks who are already big fans. Meanwhile, Democrats are running on retaining the Obamacare ban on pre-existing conditions; humane comprehensive policies on immigration; single-payer health care; a $15 minimum wage; better treatment for blacks and Hispanics throughout the justice system; cheaper higher education and more spending on infrastructure; and taking women seriously who allege sexual assault. At this point in the American election cycle, you could hardly put together a better set of issues. Right now, Republicans have nothing. Democrats have everything. They shouldn’t be afraid to make sure everyone knows that.